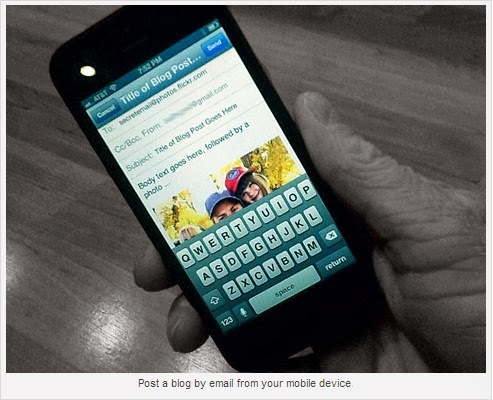 Why Blog From a Mobile Device? OK, so you’re not going to build a robust blog entirely on mobile. But once you’ve launched your blog using a platform like WordPress, a computer is no longer required to continue posting, engaging and building your brand online. In today’s mobile, 140-character world, more readers prefer their content in bite-sized chunks—which makes quick-hit and multimedia posts from a mobile device ideal in some cases. And microblogging doesn’t have to be just a Twitter thing. Many new WordPress themes have custom content types baked into the editor and design for short blurbs, photos and even asides. 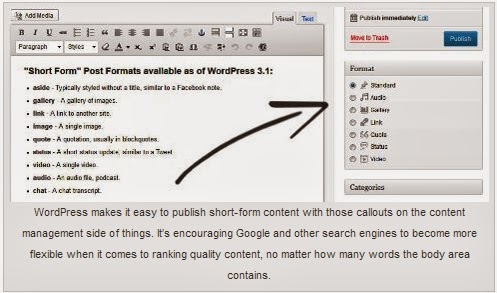 In fact, a standardized list of these “short-form” post formats has been recognized since WordPress 3.1, and bloggers can now customize their themes around these specific, shorter-than-normal posts. That standard list of post formats includes Aside, Audio, Chat, Gallery, Link, Quote, Status and Video. You’d be hard-pressed nowadays to find any official Google documentation that suggests minimum word counts for blog posts. As long as you do your best to create unique, resourceful content that provides value to search results, you’re going to rank well in search. That, combined with the unprecedented adoption of mobile, makes posting to a blog from a mobile device easier and more valuable than ever. This means bloggers no longer have to remain chained to a desktop to stand out online. In the mobile world, “note”-worthy apps such as Evernote get a lot of the attention. And while cloud-based note-taking apps are a huge leap forward in terms of mobile content development, I prefer to cut out the middleware and publish straight from the app I’m writing in. WordPress for iOS: (WordPress also has apps for five additional mobile platforms): The WordPress app is amazing because it streamlines the bloated desktop-publishing process and lets you simply publish text, photos and video straight from your device. The only drawback is formatting text and HTML can be a pain, so save yourself the headache and keep your copy simple when blogging from a mobile device. CoveritLive: I’ll focus on event marketing in a bit, but whenever I’m blogging an event and want to collaborate with others, there’s no better app than CoveritLive, which essentially embeds a live chat into your blog. Quicklytics: In terms of blog stats, I rely on Quicklytics to track Google Analytics on all of the blogs in my portfolio. So if a topic on a blog starts going gangbusters, I know about it at the swipe of a thumb and can complement that topic with a related post or make any necessary tweaks from my handy-dandy WordPress app. But you don’t even need an app to push quality mobile content to your blog. Read more below. One of my favorite mobile blogging approaches is to send posts to my site via email. With some tweaks to your admin settings, you can publish via email to your WordPress blog. WordPress gives you a unique address to email posts to, so be sure to keep that email address secret to avoid spam hitting your site. In terms of posting, the title of the post goes in your email subject line; the body text goes in the body of the email. Hit Send, and your post will get published as soon as the email hits your web server.